Have you ever needed to resize an interior composite hollow core door? More often than you may realize, a standard replacement interior composite hollow core door, from your local home supply store, will need resizing to fit an existing door frame. 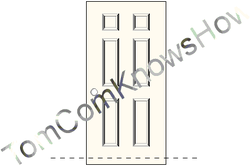 Standard interior door widths typically vary from 24" - 36" wide by 80" tall. Allowing for a threshold, carpeted or tiled floor, you may only need 77" or so. Shortening these doors is a relatively simple process, providing you have about half an hour and access to the right tools. 1. Transfer the measurement to the door, after you have measured the frame opening and allowed for a threshold and carpeted, tiled or hardwood flooring. 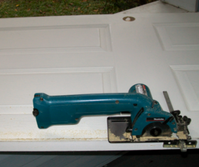 Remove the excess from the bottom of the door, using a circular saw with an edge guide for a straight cut. To keep your cut parallel to the floor, clamp a straight edge to the door to guide the saw. 2. Fold the cardboard back approximately 3/4 of an inch, if you have removed enough wood to expose the core, to allow for the wood trim you will need to replace. 3. Carefully remove any rough or torn edges from the composite board after you have folded the cardboard back up inside of the door, using a razor knife. 4. Use a 5 in 1 tool and your razor knife to remove the composite board from the 3/4" x 1-1/8" wood trim. Knock off the blocks left over from the door edges. You should remove as much of this excess material as possible, leaving smooth surfaces. 5. Apply wood glue to the inside of the door as well as to all 4 narrow edges of the wood trim. Reinstall the wood trim using a hammer to tap it in flush, from one end to the other. 6. Apply several clamps, to hold everything tight until the glue cures. Wipe away any excess glue, with a damp cloth. 7. Keep in mind that there is only 15/16" of wood frame on the hinge side and only 1/16" more on the latch side. If you need to remove more than 1/2", split the difference and take some from both sides. If you need to remove more than that, go with a solid wood door. A solid wood door will cost more now. But, replacing a weakened hollow core door will cost you later! * If you are short on time or patience, or have more than one door to resize, buy a length of wood trim 3/4" x 1-1/8" to replace what you removed from the bottom of the door. * Prime all bare wood, to keep it from swelling. * Hang the door on its hinges, before painting and installing hardware. * Hollow core doors offer no security or weather protection and, therefore, should never be used as entry doors.